Waiting for Swapforce - Skylander Obsesed! Anyone who knows our little family will now that we are Skylanders obsessed. Even wee Georgie who pipes up "Why-wan-wer" when ever he sees the logo or a character from the game on ANYTHING. The kids have Skylanders lunch boxes, and PJs, and a collection of figures of their own as well as the communal ones the whole family uses. I'll admit that me and the Hubby have our own collection too. 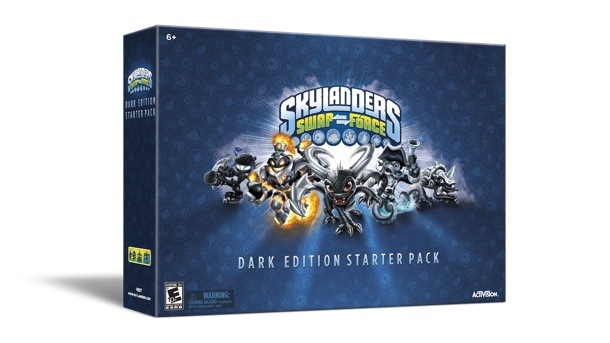 It's driving us BONKERS that we (Europe) are the last ones to get Swapforce... We hav e to wait until the 18th Oct (Yes, I know that's only Friday, but we've been waiting for this since Spring!) All over Facebook and Twitter I am seeing folk make posts and share pictures of all their new figures, the new game, clips of gameplay and reviews. While all we can do is stare at the character lists and dream about which ones we're going to buy (make that "buy first", we'll wind up with them all eventually) and watch endless YouTube clips, drooling. It's a big thing in this family though. It's the only game that we ALL love. Having an hour or two on Skylanders together as a family as become part of our routine. OK, so the littler lads don't get in on the console game because they are still a bit young to play it properly, although Tom does give it a go. They both like to play Skyanders Lost Islands on my iPad. Jack will often play Spyro's Adventure and Giants with me or his Dad on the Will, he has his friends over with their characters, and plays with his cousins and Aunty Jenny when we go to visit. And when the kids are in bed, me and the Hubby will play it together too. It's great watching Jack learn to play cooperatively, planning how to do a mission, sharing the treasure, and the food to heal the characters, learning he can't get a certain upgrade until he can afford it. Playing computer games doesn't have to be a bad thing if you can turn it into something good, and I think we manage that. He works hard at being good to earn some game time (it does have to be earned) He's been carefully saving his pocket money in real life to buy second hand characters from Game in town too.